Rail Trail | Andes Works! The Andes Rail Trail is an easily accessible hiking trail in an idyllic setting, suitable for individuals and families of all ages. The trail starts at the beautiful pergola and gate, at 266 Depot Stree. Pass the historic Depot Building, erected in 1907. The first section of the trail continues for one very flat mile (2 miles round trip) along the old rail bed, and provides a peaceful experience of field and woodland beauty and wonderful mountain views. In June 2013, the Bullet Hole Spur addition to the hiking trail was opened. The Spur extends the rail trail an additional 2.2 miles, bringing the option of the total walk to 3.9 miles round trip. The Spur climbs the ridge above the rail bed, taking hikers through mature hardwood forest, open woodlands covered in ferns and princess pine, an old pine plantation and hemlocks towering above the Bullet Hole Creek. The Spur is a bit more strenuous…there are a couple of well-designed moderately steep sections but they are followed by relatively flat sections so you get a nice breather after working a little harder. There are many wonderful views of the Tremperskill valley from the Spur. The land along the trail is home to a variety of animal species and plant life, including raccoons, deer, coyotes, fox, turtle, bobcat, hawks, owls, and many kinds of birds. The Andes Rail Trail offers a wonderful experience in every season. Spring brings an explosion of wildflowers, followed by the wild grasses and Joe Pye weed of summer, breathtaking fall foliage and austere and previously hidden views in the winter. Enjoy a virtual walk on the trail created by one of our neighbors! A big THANK YOU goes to the Common Ground Garden Club and the other volunteers and contributors that made the entry to the rail trail a very successful and beautiful community project. 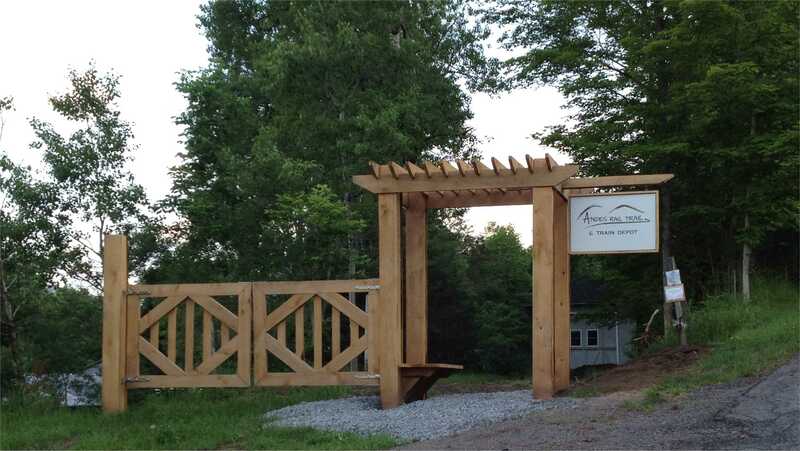 The entryway was designed by Mel Bellar, Garden Club member and owner of Zone4 Landscapes, and constructed with donations and labor from the Garden Club, and members of Andes Works!, the Catskill Mountain Club and generous Andes citizens. It is truly a wonderful addition to the trail. Very easy: 1 mile (2 miles round trip) is flat, travelling on the old rail bed. Moderate: The second mile climbs up Hemlock Knoll with a switchback with stone steps in places ending above the Bullet Hole Creek. This portion is a moderate climb and makes the trail approximately 4 miles in total, round trip. Trail surface is natural, with grass, dirt, roots, stones and sometimes mud, in spots. Track ties can still be felt under foot in many areas. A small bog boardwalk spans the muddiest area. There may be wet and muddy spots during rainy or snowy spells. We received a grant from Parks and Trails, NY to erect a kiosk and create a brochure that people will be able to pick up in town to learn more about the trail. Check out our trail brochure. Temporary content can already be seen in our lovely kiosk that echos the architecture of the train station. We were featured in an article in the national magazine, Rails to Trails. Read about our little trail here. The layout of the second section of trail. We’d love to continue the project by adding additional benches, connecting the trail to Ballantine Park and restoring the historic Train Depot Building. This Trail was created with the generous permission of many individual landowners. Note: There is no cell service on the trail. The Andes Rail Trail would not be possible without the generous permission of many individual landowners. The Trail is a cooperative effort between Andes Works!, the Catskill Mountain Club, and the Town of Andes. Together, volunteers from these groups built a bog boardwalk, put a railing on an existing bridge and cut and trimmed their way to a beautiful path right in the village of Andes. Thanks to the Trail Team! Be sure to visit the fine shops and eating establishments in the Town of Andes before or after your visit to the trail! It’s a great trail; we love the depot. I was just wondering if there are signs posted at the beginning of the trail about hunting season. I was up hunting this past weekend and while sitting there I had seen a bunch of people walking on this trail wearing NO orange on at all. Are they aware that it’s hunting season? They are just lucky that I am a not one of these stupid hunters that shoot at movement or sound. The people should be made aware of the season dates and to wear orange. Thank you. There is a sign at the trailhead stating that it is hunting season and that while hunting is not allowed on the properties of the trail, hunting is allowed on adjacent properties and people should wear orange. Unfortunately, if people arrive at the trail without having any orange gear, many may choose to hike there anyway. I suppose a “lending library” of orange gear would be nice 🙂 — thank you for your comment. Hi was at your rail trail this past weekend (2/24/18). Thanks for a lovely trail. The information signs along the trail are a nice detail.